Peggy Velusa Gabriel (Harris) Green was born on September 16, 1935, in Miami, FL to Clinton and Emily Gabriel. She was an only child and was preceded in death by her parents. Peggy was educated in the Dade County Public School System where she graduated from Booker T. Washington Senior High School. She met Willie E. Harris and was united in marriage on February 11, 1954. This union brought three beautiful daughters: Michelle, Errolyn, and Jennifer. Peggy met Clinton Gerof Green in the Spring of 1964. They were united in marriage on October 14, 1966 by Rev. S.A. Cousin at Greater Bethel A.M.E. Church. After marriage, Peggy devoted herself to finishing her post-secondary education by obtaining a Bachelor and Master’s Degree in Education from Nova Southeastern University. Peggy was a devoted member of the Church of the Incarnation and served in numerous capacities such as St. Monica’s-Daughters of the King, St. Elizabeth Chapter, Episcopal Church Women, and the September Birthday Club. Peggy loved to support and PARTY! She wouldn’t miss a good fellowship such as the Church Annual Mardi Gras. Peggy especially loved Service, Sisterhood, and Scholarship which made her want to become a member of Delta Sigma Theta Sorority, Inc on March 11, 1984. She was a devoted “Delta Dear”. She also loved attending and fellowshipping with the Booker T. Washington Alumni Association. Peggy graduated from Booker t Washington High School in 1954. 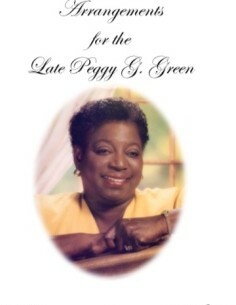 Peggy especially loved service, sisterhood, and scholarship. Those virtues encouraged her to become a member of Delta Sigma Theta Sorority, Inc. She became a Delta on March 11, 1984. She was a devoted “Delta DEAR”. Peggy was a loving mother, grandmother, great grandmother, aunt, cousin, and friend. She is a devoted Christian who believed in making a difference in each person’s heart. Cherishing precious memories are her devoted daughters: Michelle Carter-Scott, (Edgar), Errolyn Aaron (Robert), and Jennifer Cooper (Clement); grandchildren: Vincent Carter, Sr., Christopher Carter, and Tiffany Sholtz; great grandchildren: Kai Carter and Vincent Carter Jr.; godchildren: Charles Latimore and Nicole Major, brother/sister-in-law: Clarence and Gwendolyn Dickson, and a host of sorrowing nieces, nephews, cousins, and friends.